Nowadays, when I hear Women In Love, that chorusy sound of Ed's guitar, reminds me of his post Diver Down era sound, almost exactly like the 5150 album. From what I understand, it's some type of Eventide rack device. Back in the '80s, I used to replicate that sound with my Dean Markley half stacks and a Boss Dimension C, and DD-3. It was fairly close. Anyway, wouldn't that make finding the exact pitch difficult? I know I can never tune with a chorus on. BTW, I have a 8 string lap steel, too, but haven't played it for a long time. You know, too many irons in the fire. I had a Fender 800 S10 pedal for a while, but I sold it. When I had it, I was really jonesin' for the Peterson Strobo Stomp. I believe he used the Eventide detune sound on "Women In Love", both for the intro and the chorusy-sounding quiet parts of the song. There are actually two guitars going in the song proper...one is the main distorted guitar and the other is the cleaner detune chorus effected guitar. I made a clip of myself playing the intro to "Women In Love", but I didn't use the detune chorus sound in my H9 because I needed to use the compressor algorithm...I would need a second H9 to get the detune chorus on one H9 and the other for the compressor. Dang garbeaj, excellent playing! Nice demo! So you must be tuning to the song, as it's playing, and then check the cents with your tuner. I thought you were checking from the song, directly to your tuner. After not hearing Women In Love, for an embarrassingly long time, when I got the CD last year, it was a freaky flash forward to the 5150 sound to me. I'm just getting back into VH again, after being on a country chicken pickin' tangent for the last 25 years. My roots are with Edward. I looked up that H9 thing, and now my mind is blown! I'm somewhat archaic and still don't even use the data capabilities on my phone. I feel like I just stepped out of a time machine, lol. Thanks! Yes, I tune to the record using my ear and then fine tune using the Peterson as a guide...eventually I zero in on the correct pitches for each string to within 1/100th of a cent. I record the pitches by creating a preset on the Peterson Strobo Plus HD and I share the presets on Peterson's Connect website. The H9 is amazing...incredible that we can have those sounds affordably now! I used the isolated guitar track and the DCC Compact Classics Master Recording gold CD for reference. I used my '75-'76 Ibanez Destroyer to find and notate the tunings which is the closest guitar I have to Eddie's original '75-'76 Ibanez Destroyer. I haven't yet notated the tremolo equipped guitar (presumably the black and white Frankenstein) used on the intro and outro harmonies, but I would guess that the tuning is probably the same...but as you can see from this thread, you never know with Eddie! 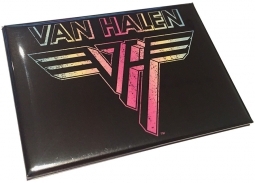 I used the remastered HDCD version of Van Halen II for reference. I used my Ovation steel string acoustic guitar to find and notate the tuning. This is the closest guitar that I have to the Ovation nylon string acoustic guitar that Eddie used on the original recording. Last edited by fudd; 11.27.17 at 10:42 PM. It is totally insane that the harmony guitars (presumably the Frankenstein) are tuned almost +16.0 cents higher than the main guitar track (presumably the Ibanez Destroyer). I used my '78 Musikraft/Locke Frankenstein replica to find and notate this tuning and I used the isolated tracks along with the DCC Compact Classics gold Master Recording CD for reference. It wouldn't seem like this would work, but it does! I actually used a Ditto looper to recreate the harmony parts using my Eventide Harmonizer (there is Eventide on the harmony guitars on the original recording) and my '78 Frankenstein replica and I've been able to play the main parts of the song with my Destroyer tuned the way I notated it above (roughly 16.0 cents lower than the harmony guitars) along with the looper playing the harmonies that I created. It works! It shouldn't, but it works! I'll make a clip of me playing the main parts with my Destroyer and the looper playing the harmonies I pre-recorded soon and post it here...what a whacky tuning situation in this recording! Last edited by garbeaj; 10.05.16 at 02:15 PM. Here is the clip I said I would make above...I recorded the outro harmony parts in layers onto my Ditto Looper using my '78 Frankenstein replica which is tuned approximately +26.0 cents above Eb or half-step down tuning. I then switched to my '75-'76 Ibanez Destroyer which is tuned to approximately +10.0 cents above Eb or half-step down tuning and made this clip of me playing the main rhythm guitar part while my Ditto Looper is playing the outro harmonies that I pre-recorded. I also used my Eventide H9 on the harmony parts since it was used on the harmonies in the original recording too...but you can't hear the harmony parts very well in this clip! My timing is off (I should have used my metronome function on my Peterson Strobo Plus HD tuner!) and it is pretty difficult to hear the parts distinctly, (I'm still a hack at looping), but with all that said, I think I accomplished the goal of the clip which was to show that despite the very different tuning for the harmony guitars versus the tuning on main rhythm guitar, these parts WORK...in my clip and on the original recording. Last edited by garbeaj; 10.06.16 at 03:16 PM. Here is a clip I made just for fun where you can hear the loop I created for the outro harmonies. The loop was kind've drowned out by my rhythm guitar part in the clip above, so at least you can hear the loop in this clip by itself. The outro overdubs are interesting because of the radically different tuning to the main guitar part, but also the parts themselves are cool. The first statement of the melody is just a single guitar track with a little fattening from the Harmonizer...then there is one actual harmony on the second half of the melody. The rest of the overdubs are essentially doubled, but each guitar plays a very slightly different part. Put it all together and it works...incredibly, especially given the fact that the harmony guitars are tuned so much higher than the rhythm guitar. This is the same tuning as on the clean "Women In Love" intro guitar and "Outta Love Again". This is a tuning that Eddie seemed to return to several times. Last edited by garbeaj; 01.11.17 at 10:03 AM. I have to get a peterson strobe tuner. This stuff is too cool. You absolutely, positively can't go wrong with the Peterson StroboPlus HD. Thanks for the advice. I never knew which one to get. I just ordered it. I'll let you know when I get it. I always wanted to mess with these alternate tunings. Once you get your tuner, be sure to watch all of Peterson's tutorial YouTube videos and go on their website. First, make sure your intonation is set perfectly by using the ACU preset. If you don't know how to check or set your intonation, take your guitar to a qualified and pay around $50 for a complete set up. Once your guitar is intonated correctly, you will be able to go to the "Trading Post" section and you will be able load all of the tunings I have posted here directly to your tuner. You can then tune your guitar to each specific song tuning without having to think about it and without having to make any adjustments. Say you want the "You Really Got Me" tuning...just look in the "Trading Post" for the offsets I posted for that song, follow the instructions to load it on your StroboPlus HD and tune each string using that preset. Voila, you'll be as close to perfectly in tune with the original recording as physics will allow! Thanks for all the help. I watched a few youtube tutorials. I don't know how I made it this long without owning one of these.